HYG price decreased by 0.05% due to paid dividends effect. US Treasury yields slightly shifted upward and 10Y yield was 2.50%. 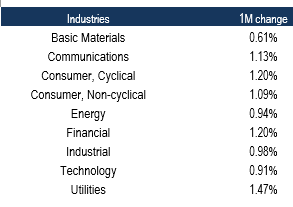 All the sectors demonstrated strong performance last week as underlying HYG portfolio increased by 0.39% due to strong US macro data and progress on US-China talks. During the last week, the iShares iBoxx $ High Yield Corporate Bond ETF (HYG) has slightly changed (-0.05%) primarily due to monthly dividend payments last week. HYG underlying portfolio grew 0.4% as investors were encouraged by better-than-expected jobs data and progress on the U.S.-China trade talks. Both US and China leaders made positive comments on the trade deal progress. The HY market has seen a strong performance in Q1, more than offsetting last year’s negative returns and outperforming many other bond ETF. Changing rates’ expectations, progress on US-China talks and the search for yield has driven investors back to the HY asset class, which has seen strong fund inflows during the last quarter. SPDR Bloomberg Barclays High Yield Bond ETF (JNK) was among top ETF funds that gained the largest inflow (12% of AUM). Only equity ETF’s (SPY and EEM) outperformed HYG due to higher sensitivity to US-China trade talks and overall risk on. In Q1, HYG price recovered its value after sharp decline in 2018. The spread has been also declined in Q1 and reached 4% value that was observed in November 2018. HYG has not yet been close to spreads seen in 2018 (3.5%). 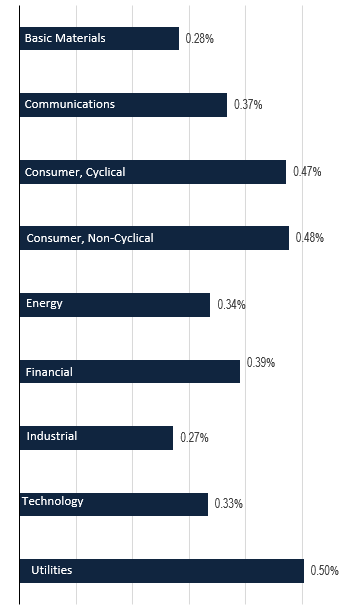 The technology and energy sectors were among the best in terms of YTD spread narrowing. US Treasury yield curve shifted slightly upward during last week due to strong US macroeconomic data. The 2-year Treasury note yield was up 4 bps to 2.34%, while UST 10Y yield was 2.5%. There is no yield curve inversion, but term spreads (10Y-3m and 10Y-2Y) are extremely low. Overall, the US macro data was strong last week, especially labour market data. Initial jobless claims indicator hit the lowest value since December 1969 — and was down from the previous week. Moreover, the claims were actually lower than economists expected. Still the data point to signs of strength in the labour market amid concerns about a US economic slowdown. Job report published on Friday, indicated sharp non-farm payroll growth in March, but disappointing average hourly earnings. Non-farm payrolls were above expectations and 3M average. Average hourly earnings rose only 0.1% MoM (3.2% YoY vs. 3.4% in February) in March and were below consensus. Slower wage growth could indicate lower inflation pressure. US services sector notches slowest pace of growth since 2017. The non-manufacturing index fell MoM in March and was weaker than the median forecast among economists. Despite March weak index result, respondents remain mostly optimistic about overall business conditions and the economy. The underlying HYG portfolio price increased by 39 bps, but distributed dividends lowered NAV by 4 bps. As a result, HYG price decreased by 2 bps last week. All the sectors demonstrated strong growth last week. 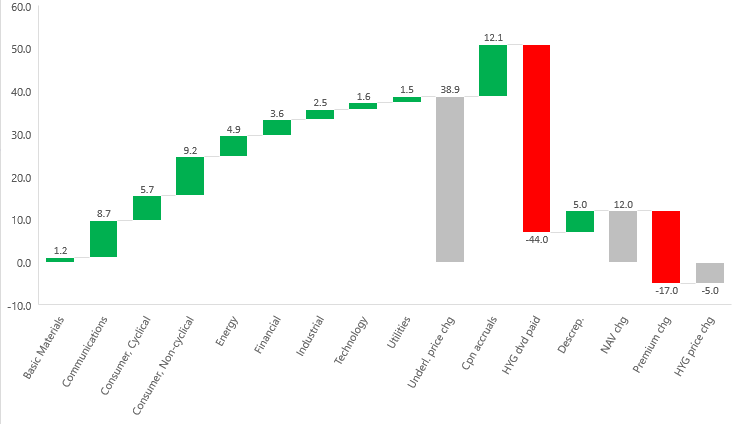 The best performers were Utilities and Consumer sectors while basic materials poorly performed. Utilities sector was the best performer and grew by 0.5% primarily due to significant growth of several bonds. Moreover, utilities sector demonstrated the best monthly return among other sectors. Consumer sector (cyclical and non-cyclical) performed well both monthly and weekly. Basic materials sector demonstrated positive but weak performance compared to other sectors’ performance primarily due to falling steel and copper prices as steel and copper companies represent 40% of the basic material sector. This week, we see the start of US earnings season and the financial results of several large US banks. US earnings season is quite important for investors as it could indicate current demand in the economy and corporations’ sentiment.